HearthCabinet's ventless fireplaces were created by a team of fireplace designers led by Michael Weinberger, an inventor and product liability attorney, and Arthur Lasky, an architect and designer. They were seeking an innovative fireplace solution for use in homes and buildings that cannot accommodate the installation requirements of conventional wood or gas fireplaces. HearthCabinet employs a patented system that uses specially designed alcohol gel fuel cartridge in a locked safety firebox. Since the alcohol burns so cleanly, no chimney, gas line, or electricity is required, allowing HearthCabinet Ventless Fireplaces to be installed virtually anywhere. HearthCabinet created fireplaces without a chimney. Our decorative, no vent fireplaces' unique design features ensure a safe and satisfying fireplace experience that can be custom-tailored to match any project. 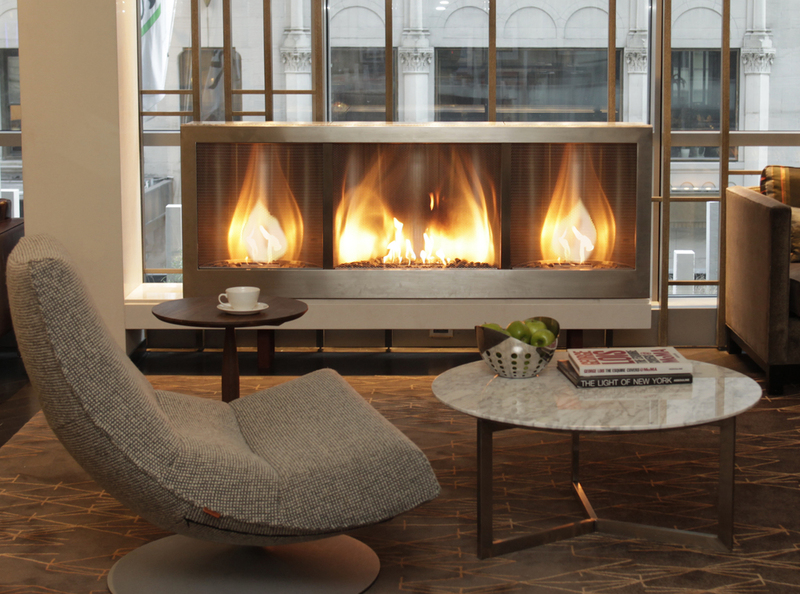 Since 2005, HearthCabinet Ventless Fireplaces have been used in some of the finest residential, hospitality, and commercial spaces across the country and remain the only ventless fireplaces approved for use in New York City. Headquartered in New York City, in-house architects and design professionals provide personal, one-on-one design consultation offering stunning bespoke solutions for any project. Dedicated to incomparable quality and service, every HearthCabinet Ventless Fireplace is handcrafted in New York by local artisans to exceedingly high standards. Fireplaces have always been central to the idea of home and HearthCabinet is passionate about continuing that heritage. HearthCabinet Ventless Fireplaces continues to expand its presence nationwide. For the latest news about HearthCabinet and their vent-free fireplace design, click here. HearthCabinet's Ventless Fireplaces have unique, innovative features that set them apart from every other fireplace in beauty and safety, making them the choice of top professionals everywhere. HearthCabinet's ventless fireplaces use a clean-burning alcohol gel fuel cartridge system that requires no chimney, gas, or electricity. This allows for unparalleled design flexibility and eliminates the considerable construction costs associated with conventional wood and gas fireplaces. HearthCabinet's ventless fireplaces are known for their real, roaring flames that fill the fireplace with a mesmerizing golden fire that actually crackles. Unlike a wood or gas fireplace there is no smoke or emissions requiring venting. Cartridges come unscented but are also available in pine, vanilla, or cinnamon. Unique safety features cement HearthCabinet's ventless fireplaces’ best-in-class reputation. The non-toxic, single-use alcohol gel fuel cartridges are pre-filled, so there’s no pouring of fuel, and offer significant advantages over wood and gas. Every HearthCabinet ventless fireplace has a top-hinged, locking, rigid steel-mesh screen door that prevents inadvertent contact with the flame, ensuring the safety of loved ones and property. HearthCabinet ventless fireplaces are lined with industrial insulation to protect surrounding materials and to project heat into a room. HearthCabinet Ventless Fireplaces are the ONLY ventless fireplaces approved for use in New York City by the New York City Fire Department and Department of Buildings. To see our approval letters click here. We offer a luxurious range of standard models that fit most project needs but can also custom-tailor a true bespoke decorative ventless fireplace of any size or style. To see our list of product offerings click here. Designed in Manhattan by experienced architects and handcrafted in Brooklyn by the best local artisans, HearthCabinet guarantees peerless, beautifully detailed ventless fireplaces that will be any room’s prize piece for years to come. Learn more about our production process here. Installing a HearthCabinet ventless fireplace can be done in minutes. Fully assembled and completely self-contained, HearthCabinet ventless fireplaces slide into place and are secured with four (4) screws through the base of the firebox. There are no required connections of any kind. Check specific model spec sheets for more installation recommendations. We understand people’s passion for fire and we share ours through dedicated one-on-one professional design assistance on every project. Our in-house team of architects and designers will walk you through the ordering and design process start to finish. To get started on your project contact us today. For our latest e-brochure, click here. We love that our customers love their HearthCabinet Ventless Fireplaces. Check out what they're saying here.